With Jetpack on your site, you can get notifications for new comments and Likes on your WordPress.com and Jetpack sites, in your admin bar, on your desktop, and on your mobile device! Toolbar Notifications allow you to view and moderate comments right from the toolbar, anywhere on your site or across WordPress.com. To use notifications, a user of your site must go to the Jetpack admin page and link their account to a WordPress.com account. This step isn’t necessary if you’re the main user who connected the Jetpack site to WordPress.com. Once your account is connected to WordPress.com, click on the notifications icon in the toolbar and log into WordPress.com if you’re not already. Now you’re set to view and moderate comments on your site and from anywhere on WordPress.com. Note that in order to moderate comments from the notifications toolbar menu, a user must have comment moderation privileges (if the user can moderate comments elsewhere, they will be able to in notifications also). For more details on using Notifications (and keyboard shortcuts) see the WordPress.com support page. When using a modern version of Firefox or Chrome, you can have your notifications pushed directly to your desktop. For more information and to learn how to enable it, visit the Browser Notification announcement! Mobile notifications allow you to receive notifications of new comments on your Apple or Android devices. They make it easier than ever to keep up with your readers and moderate comments on the go. 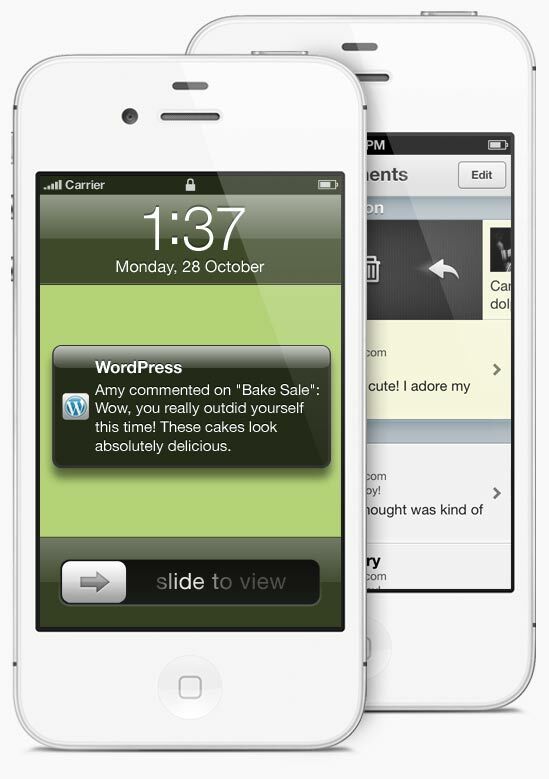 Install a WordPress mobile app. Make sure the Notifications module is active in Jetpack. Done! Enjoy your new notifications. If you’d like to learn more about push notifications read on for more details. Once you’ve activated Mobile Notifications in Jetpack, you will receive Push notifications if you have installed a WordPress mobile app on your mobile phone. A user of your site must go to the Jetpack admin page and link their account to a WordPress.com account. That ensures that they have their own channel for push notifications. This step isn’t necessary if you’re the main user who connected the Jetpack site to WordPress.com. In that case you’ll receive notifications without any further adjustments. As soon as you get a new comment on a post you’ve published, a push notification is sent to your phone. You will see the name of the commenter, which post they commented on, and a short excerpt of the comment. Swipe over the notification to view the comment. This feature is activated by default. While there is no deactivation control from within the Jetpack settings interface, you can deactivate it by following this guide. Some visitor-related information or activity may be sent to the site owner via this feature. This may include: email address, WordPress.com username, site URL, email address, comment content, follow actions, etc.